On November 2nd, 1886, the students - 80 in all - moved into their new classroom in the new high school department. Enrollment continued to grow from 250 students taught by six sisters to 440 including the high school by 1896. Many students remained for only one, two or three years, and would then leave high school to go to work. However, in June of 1894, two students completed four years of study, thus becoming the first graduates of St. Mary's High School. By 1921, enrollment had reached 544, in both the grade school and the high school. The large classes could no longer be accommodated in the school. The old convent situated just behind the school building was remodeled and fitted for classrooms. The high school now extended to grade 12 and since Marquette Hall, what was erected as the parish hall, was being used very little, the entire high school department - 102 students - moved into the second floor of Marquette Hall in September of 1925. On May 4th, 1928, the high school received accreditation from the Indiana Superintendent of Schools, thus becoming the first four-year accredited Catholic high school in Northwest Indiana. October 1937 brought about two "firsts" - school uniforms and a school newspaper, The Marquette. The name Immaculata was chosen in November of the same year for the annual yearbook, a name which continued until 1968. The school club activities in the 1930's included Girls' Glee Club, Latin Club, Debate Team and oratorical contests. In the fall of 1934, it was announced that the third floor of Marquette Hall would be turned into a gymnasium. With the new facilities available, a boys' basketball team was formed. By 1945, the athletic program produced nearly 100% participation from the student body. Also in 1945, Msgr. Vurpillat announced the erection of a new Catholic high school, gymnasium, and social hall in the near future. However, the project went on hiatus until 1949. On January 30th, 1954, contracts were signed for the construction of a new parish high school. In 1955, the present high school was completed. March 25th, 1955 was moving day for students and faculty. As the convent archives state: "Perhaps the happiest day ever known to both the faculty and students of the high school took place today when we all moved into our new high school." The renovation of Marquette Hall began the following week. It was completed on April 13th, 1956. Located in the lobby of Marquette Hall stands the statue of Father Marquette, which was formerly outside the front of the building. It was a well-known fact that the 1960's was a great time of great social upheaval and St. Mary's was significantly induced to change. St. Mary's was diminished in size with the growth of Queen of All Saints and Notre Dame parishes. The cost of operating the high school by St. Mary's parish alone became prohibitive. As a result, it was decided that beginning with the 1968-69 school year, St Mary's High School would become a city-wide Catholic high school named Marquette High School. It was felt this would aid in the transition to a dual enrollment school scheduled to begin in 1971. Therefore, the commencement exercises on June 2nd, 1968 became the final commencement of St. Mary's High School. 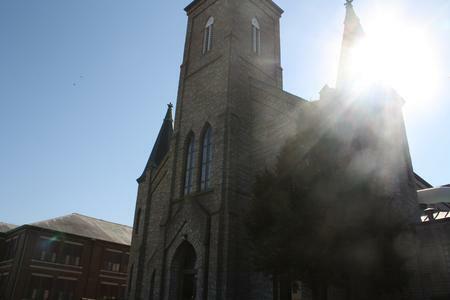 The replacement of priests and sisters with lay teachers caused a financial crisis in 1971 that threatened the continuation of Marquette Catholic High School. Costs were escalating and enrollment was decreasing as fewer religious educators were available to teach in the high school. This resulted in debilitating demands on parish and diocesan funds. This crisis united the parents and lay teachers into action to prevent the closing of Marquette. The Marquette Catholic High School Finance Committee was organized to develop a plan presented by the committee to subsidize tuition. The plan included a four-year fund drive, and those efforts raised $225,000. 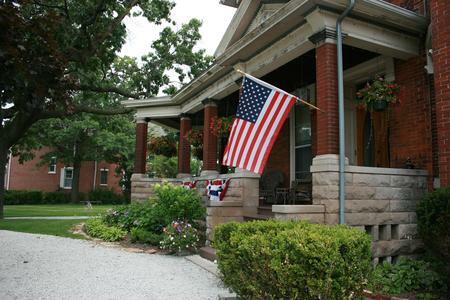 The program helped put the school on a sounder financial basis while increasing enrollment. Marquette Catholic High School held a first class certification from the state of Indiana and offered a complete college curriculum. For those students not contemplating college after graduation, there was an opportunity for a share time program. While attending Marquette, some courses in the practical arts were available at Michigan City public schools. 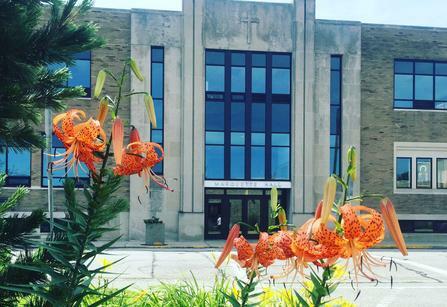 Marquette Catholic High School, the oldest Catholic high school in the Diocese of Gary, is dedicated to the goal of providing its students with a solid education in a thoroughly Christian atmosphere. The Marquette Foundation, the successor to the Marquette Finance Committee, began in 1977 to provide a long-range source of income toward operating costs of the school. The cost of education has risen sharply in recent years. 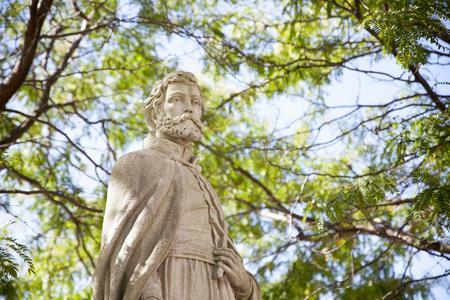 In order to keep tuition within an affordable range, the Marquette Foundation Endowment Fund subsidizes students through scholarships and provides the school with additional funding. 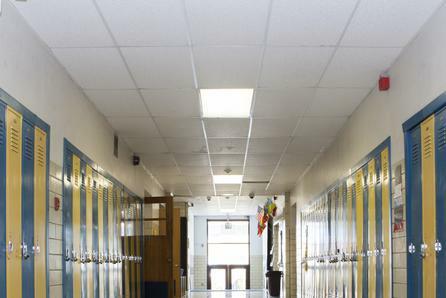 In the 1990's, the Indiana Department of Education revised its school accreditation norms. Marquette Catholic High School received full accreditation standing after participating in this new system known as the PBA Process. 21st Century improvements at the school facility were the installation of a computer lab and the Marquette Athletic Complex, including baseball, softball, and soccer. 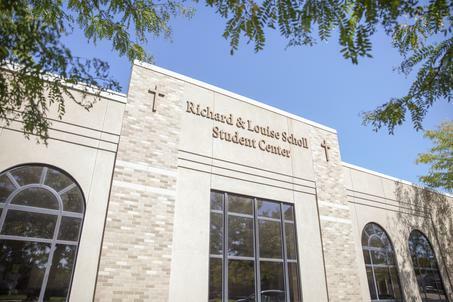 On November 19th, 2001, the Richard and Louise Scholl Student Center was dedicated. The Scholl Center houses a one-of-a-kind Global Trading Lab, a distance learning lab, a library generously equipped with computers used for research, the student commons, administrative offices, a gymnasium, locker rooms, a weight room, and beginning in 2017, La Terrazza Deli. 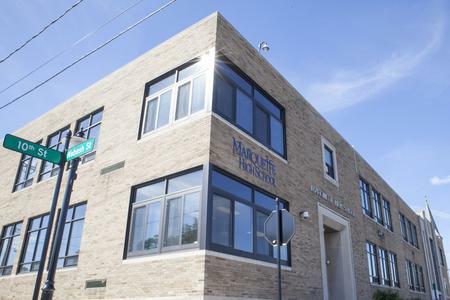 Marquette Catholic High School is a vital part of Michigan City as it has been for over 120 years. It gives everyone, regardless of religious beliefs, a choice in education. It is certainly a symbol of "Unity through Catholic Education" as students from all the Catholic parishes and from other faiths make Marquette Catholic High School their choice for high school.